Get out now. Not just outside, but beyond the rap of the programmed electronic age so gently closing around so many people at the end of our century. Go outside, move deliberately, then relax, slow down, and look around. Do not jog. Do not run…Walk. Stroll. Saunter…Explore. Heeding the words of John Stilgoe in Outside Lies Magic, a few of us went to the Seattle Art Museum’s relatively new Olympic Sculpture Park yesterday morning to make observations regarding wayfinding in urban spaces, in order to help us develop a question for research in Amsterdam. I found the park to be an incredible use of what was just recently an industrial wasteland. The layout of the park gently guides one along a Z-shaped walkway, providing many opportunities for one to saunter off into auxiliary paths and alcoves without letting visitors forget that they are in a museum. 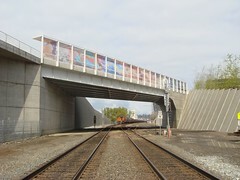 Impressively, the park integrates itself into its surroundings, crossing over Elliot Avenue and the BNSF railway, and landing at the shoreline of Elliot Bay. The morning’s slow pace allowed us to “read the city” and make many observations, especially about the rapid proliferation of condo buildings throughout downtown Seattle, and the effects that such construction has upon the city’s storied history, both physically and socially. On a somewhat unrelated note, at some point in this discussion, the topic came up that cellphone conversations almost always begin with the caller stating their current location. If you think about it, it’s true – the context of a phone call generally holds a good deal of importance, regardless of the call’s purpose, and a mobile phone does not (visibly) transmit the implicit location information carried by landlines. How long will it take before caller ID includes that contextual information, such as location and maybe even a Twitter status?